I recently launched Historical Maps of Toronto, featuring simple and free access to a selection of notable maps of my fair city. If you’ve ever wondered what ‘Muddy York’ looked like 200 years ago, and then wanted to trace the city’s development over the following century, this collection ought to pique your interest. Jim Clifford from ActiveHistory.ca asked me to take a step back and explain why I invested the time and effort to put it all together. What made it so important to share these dusty old maps? The maps deserve our attention. They allow us to imagine the past in vivid detail — and they also provide us with valuable insight into the mind-set of the map-makers themselves. My hope is that, particularly for those of us who aren’t historians or academics, the site will provide a useful and convenient entry point for discovery and further investigation into our city’s humble beginnings and subsequent evolution. I suspect that most history-driven projects take a winding path before their ultimate release. This one is no different. In 2011, my rock-climbing gym was forced to move. The 120-year-old warehouse structure in which it was housed got demolished to make way for condominiums—a classic Torontonian tragedy. In sadness I set about researching the story of the building, to commemorate its lengthy and varied industrial service prior to its obliteration. In the course of that research, I was introduced to the beautiful and informative fire insurance plans and Atlases produced by Charles Goad. Like so many before me, I embarked upon a number of dizzying pilgrimages to the Toronto Reference Library to access the maps. Although I enjoyed the visits, they were logistically inconvenient and I found myself wishing for some simple way to view the files online. I discovered that the Toronto Public Library had initiated a Herculean digitization process for a subset of the maps, and was making them available. The catch is that the catalogue interface, while extraordinary and critical, remains best suited to… being a catalogue, versus browsing the actual content. In certain situations it takes either brute force or generally-unknown, ninja catalogue search parameters to extract what you want. Meanwhile, the City of Toronto Archives website features other Goad Atlases, but the images are provided in an awkward file format. What I really wanted was what the CTA had posted, except in a medium that anyone could use. Fuelled by a similar sense of irritation, Xavier Snelgrove had ‘liberated’ six other maps from the Archives. I longed for the same to happen with the Goad maps — but you might wait forever for that to occur. In 2012 my frustration finally drove me to action, and I cobbled together Goad’s Atlas of Toronto — Online! The feedback I received from others was immediate: this was useful. Looking back I can now say it’s become a decent asset. People use it. For the next year, in the back of my mind I wanted to supplement the Goad site and post somewhere the 1858 Atlas of the City of Toronto by WS Boulton, which is kind of a predecessor to the Goad Atlases in that it shows building shapes, sizes and construction materials. I particularly wanted to create an online key map for it, as browsing its 30 plates is otherwise clumsy. I also decided to replicate Snelgrove’s work—because you never know when somebody will get tired of hosting files and pull the plug on their website. The more sources, the better. I liked the idea of providing a convenient, zero-cost Toronto-oriented map collection, and I knew anyone else doing similar research would find it handy — or at least entertaining. My prior work on the Goad site gave me a simple framework for assembling it together. I thought it would be pleasant to couple the maps with contextual commentary cribbed from Wikipedia or wherever. This notion led me to serendipitously stumble across a mouldering typewritten transcript for a 1984 Royal Ontario Museum exhibit called Mapping Toronto’s First Century, by Joan Winearls and Isobel Ganton. The exhibit has long been dismantled, but I felt that their scholarship ought to see the light of day again. Reading their text made me realize that there was a whole set of delightful maps that would be exciting for casual researchers and amateur investigators to find and be made aware of. What’s more, the maps are scattered across multiple repositories — TPL, U of T Map and Data Library, City of Toronto Archives, Library and Archives Canada, and others. An aggregated online list would definitely be a step forward. And, of course, there were other maps that Ganton and Winearls chose not to discuss that I wanted to include. It’s very seductive to add ‘just one more map’ to the site, because it’s not like there are 1,000 vitally important maps; you can quantitatively make a percentage increase in coverage with a single addition. I’ve learned a lot about the city this way. It’s an approach to history-telling that is both extremely powerful and yet fundamentally constrained — there are often gaps and lacunae, depending on whether a map is available for a given time-period, and on the particular subjective motivation for the map’s creation (e.g. is it a military map concerned with topography, is it a surveyor’s map for the purposes of real estate, etc.). I have no illusions about creating an authoritative site — many maps haven’t been digitized or aren’t online — but I do want to provide a solid complementary resource [Not everyone can shell out $50 for Derek Hayes’ Historical Atlas of Toronto]. As for myself I particularly enjoy using the ‘View Random Map’ option to idly browse through the collection. I’ve been busy working on a new, thematically-related mapping site, Fort York and Garrison Common Maps. It’s a mutual collaboration with Toronto historian Stephen Otto and The Friends of Fort York, something we’ve created as part of the celebrations leading up to the 200th anniversary of the Battle of York. Using maps, we visually trace the complex evolution in usage and ownership of Fort York and the lands surrounding the birthplace of urban Toronto. Come check it out! Nathan Ng is not a professional historian. But he does love poring over old maps, and recently launched Historical Maps of Toronto to help others explore his city’s past and development. I love this new project! Way to go, Nathan! 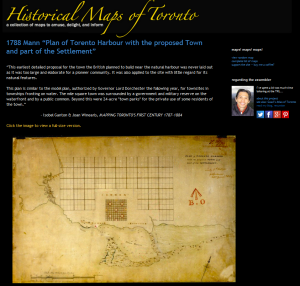 What a splendid project this is – as a longtime user of 19th century Toronto maps, I am delighted to have them so accessible on line!!! Really enjoyed the post, Nathan. Congratulations on the wonderful project OurDigitalWorld (http://ourdigitalworld.org), a Canadian non-profit, public service organization with user/members both in Canada and the United States. We provide a web-based service that enables organizations, especially non-profit community groups such as libraries, museums, historical and genealogical societies, and educational institutions to upload, describe and exhibit their cultural and historical collections easily with online tools. The goal of OurDigitalWorld is to enable the public to discover the amazing collections of historical material – especially photographs – of our communities and people. OurDigitalWorld already provides free access to over 4.1 million digital images, videos, scrapbooks, newspaper collections and more – via a powerful “one place to look” discovery portal called OurOntario, see http://search.ourontario.ca/search. Nathan you have been featured in a wide variety of sources and we have been happy to post an entry in the OurOntario portal to further promote public access to your site, see http://search2.ourontario.ca/results?site=Nathan%20Ng&itype=Maps&mt=collection&sort=score%20desc. In this way we are helping many more Canadians to discover the wonderful work that you and others like you are doing. For those who are looking for a way to contribute directly and have their individual images and descriptions indexed and hosted on the web, OurDigitalWorld also provides the VITA Digital Toolkit which is a complete, cloud-based solution for building digital collections. For a small annual hosting fee, organizations use VITA to easily upload, describe and display their collections online themselves. Community engagement and global discovery features includes export abilities so that contributors can also use their data in other systems and it’s great not only for images but for scrapbooks, documents, newspapers, oral histories, 3D objects. And it’s actually ideal for the creation of full online ‘exhibitions’ exactly like yours from any of the content that they have added through their account – or from anywhere else on the web. To see some great examples of how dozens of communities, such as Oakville, are using this feature, go to http://images.oakville.halinet.on.ca/PhotoEssays. This is a great project, Nathan. Thanks for taking the time to build this resource! This looks exciting. I’m hoping to find a list of the shops and shop-owners on King Street – mid-nineteenth century. Hey Nathan. Thanks do much for creating this site. These are a treasure trove of information and I love to look at the skill and art of the cartographers who created these maps. Nathan, you really are a true — and great — Toronto hero. Does anyone know the elevation of the Avenue Road hill in Toronto?